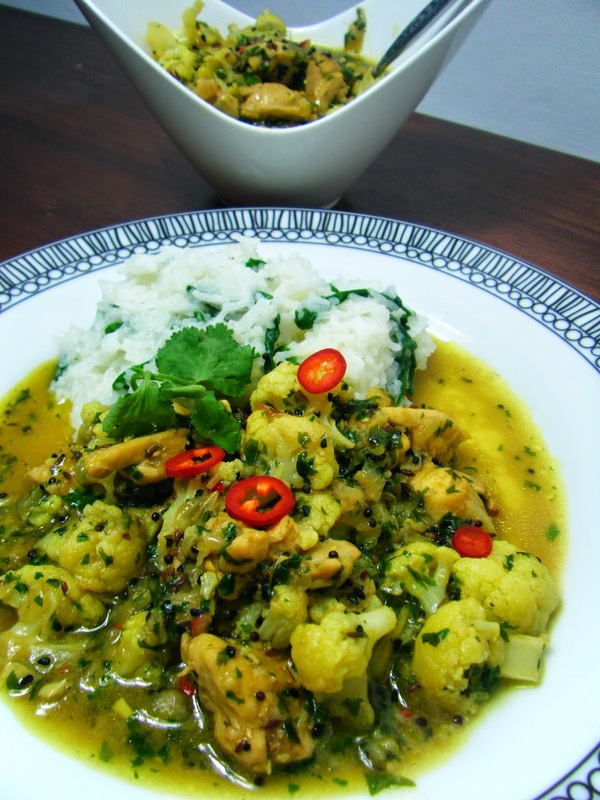 This fragrant chicken and cauliflower curry uses panch phoran a Bengali spice mix of fenugreek, mustard, cumin, fennel and nigella seeds. Serve over spinach rice to enhance the fresh flavours of this dish. Dry fry the panch phoran spices by toasting them in a clean dry frying pan over a medium heat for one minute. Shake the pan continually to ensure the spices do not burn. Put the rice on to boil following the directions on the packet. In a separate pan fry the onions with the oil and butter until caramelised. The olive oil will stop the butter from burning. Once the onions start to brown add the ginger, garlic, salt, turmeric and chili and fry for 2 minutes. 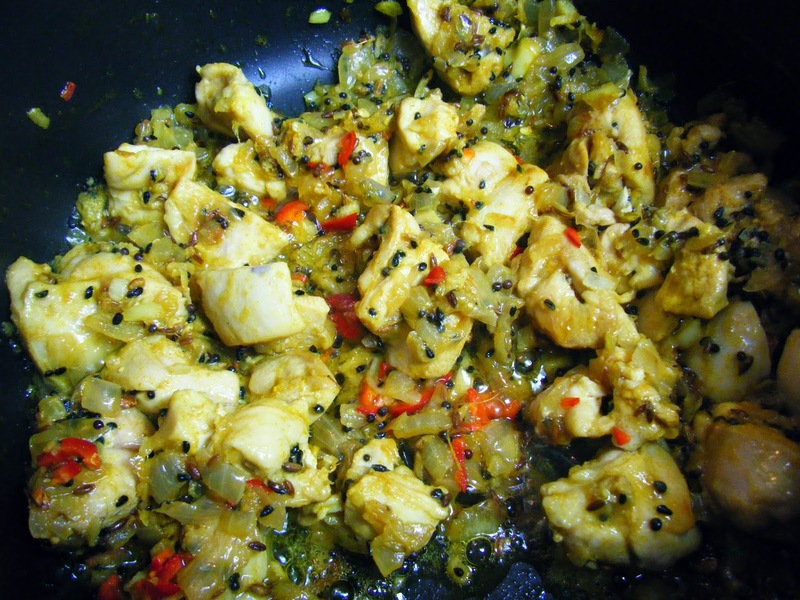 Then add the diced chicken and allow it to brown before adding the coconut milk and cauliflower. Cover the pan with the lid and simmer for 10 minutes. 5 minutes before the rice has finished cooking cut the spinach into strips and stir it through the rice. The heat of the rice will cause it to wilt. This mix of rice and spinach adds to the fresh flavours of the curry. 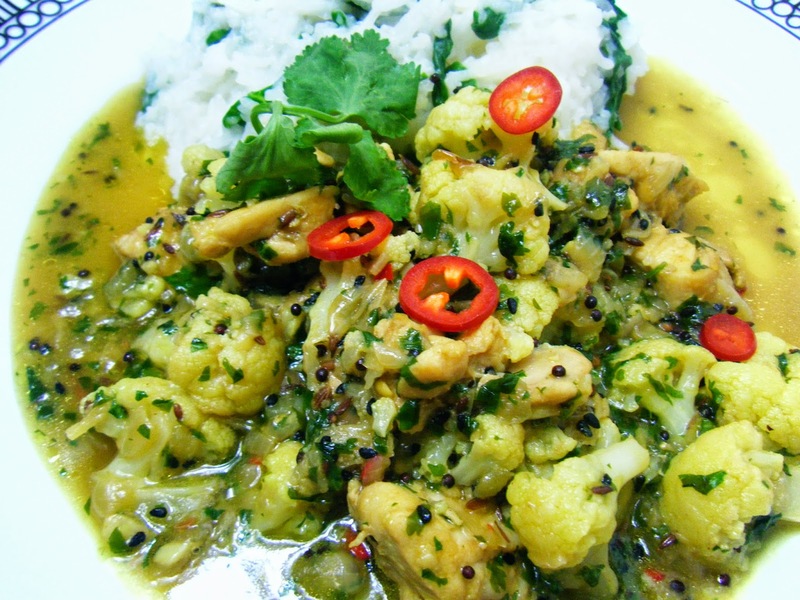 Sprinkle the chopped coriander through the chicken and cauliflower curry serve with the spinach rice.